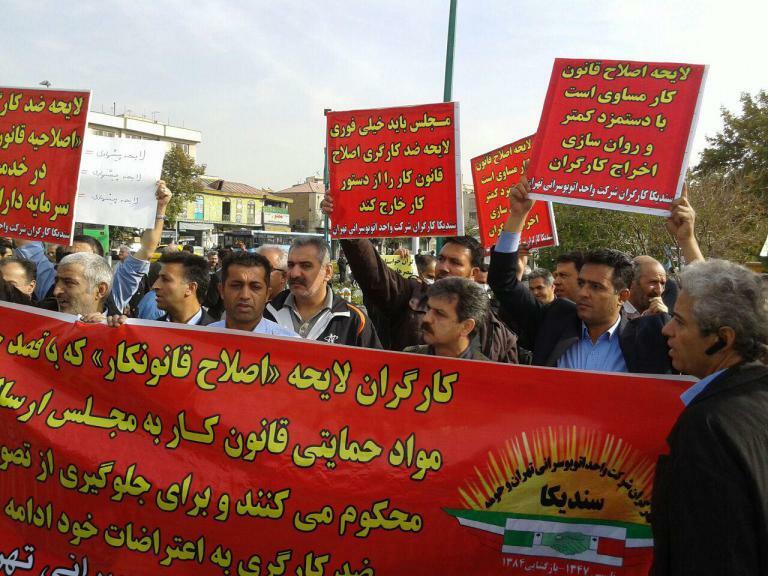 On the morning of November 15th workers protested outside the Iranian regime’s phoney ‘parliament’ against Labour Law ‘reforms’, the expansion of Free and Special Economic Zones and changes in the Social Security Organisation’s health care fund. At 10am workers, including members of the Trade Union of the Tehran Vahed Bus Company, gathered outside the ‘parliament’ building. According to an activist present at the protest, right front the beginning there was a heavy present of police, riot police, plain-clothes officers and other security personnel. When the number of workers neared 70 the security forces prevented any more joining the protest. The workers were chanting slogans that included “Temporary contracts, workers’ slavery”, “Stop the Labour Law favouring capitalists”, “Sacked workers must have jobs” and “Stop contractors”. Although the protest had been called by the regime’s own Islamic Labour Councils, the genuine activists of the workers’ movement were able to take part with their own independent slogans and demands. They were also able to denounce the anti-working class organisations of the regime. This protest shows how a workers’ gathering, even one initiated by the regime’s phoney ‘labour’ organisations, can be turned into a protest that can represent the true voice and demands of the Iranian working class.